This Sunday, we continue our journey through Saint John’s Gospel, chapter 6, and Jesus Christ continues to teach us about the Eucharist – that He is the Bread of Life (John 6:24-35). He reminds us to work for the food that endures for eternal life, which He, the Son of Man, will give us. That “work,” Jesus tells us, is to receive His gift of Faith, to believe in Him, to embrace the grace, His divine help, that He gives to us. 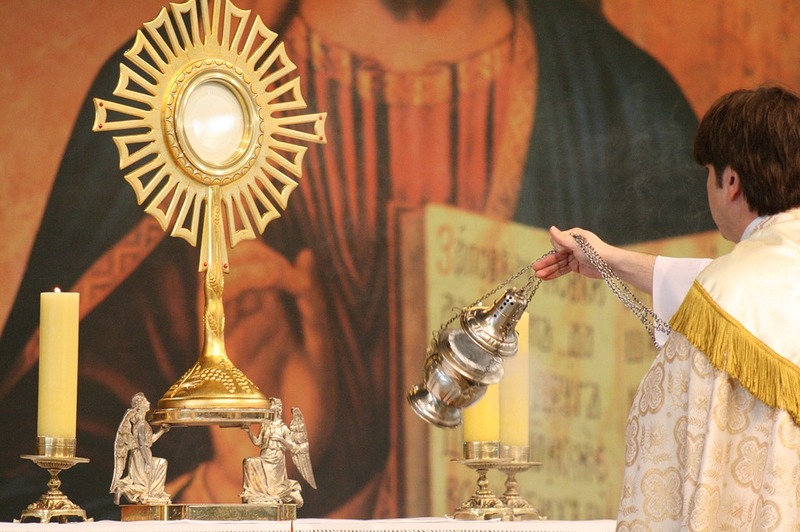 In this Bread of Life teaching, Jesus continues His lessons about the Eucharist that we receive in the Holy Sacrifice of the Mass – where we receive the best nourishment, Jesus Christ Himself in His glorified Body, Blood, Soul and Divinity, truly, really and substantially (see Matthew 26:26-28; Mark 14:22-24; Luke 22:17-20; 1 Corinthians 11:23-25; and John 6:48-72). Jesus gave us the Mass. It’s His gift to us. And He knew that we would need the Mass and the Holy Eucharist. Therefore, we read in the Catechism of the Catholic Church (#1324 and 1322-1419 ): “The Eucharist is ‘the source and summit of the Christian life.’ ‘The other sacraments, and indeed all ecclesiastical ministries and works of the apostolate, are bound up with the Eucharist and are oriented toward it. For in the Blessed Eucharist is contained the whole spiritual good of the Church, namely Christ Himself, our Pasch.’” (Pasch refers to Jesus’ Passion, Death and Resurrection and His Ascension into Heaven – our Christian Passover.) The Mass in which we receive the Holy Eucharist is the center of every Christian life. It is offered in every Roman Catholic and Orthodox Catholic church throughout the world. We could not truly live without it. My fellow disciples of Christ, thank you for showing your reverence to Our Lord by your reverence for His Mass and His Blessed Sacrament reserved in our parish church of Saint Clement. Our preparation for Mass helps us to honor Jesus Christ – praying before Mass, wearing modest clothing (our “Sunday best” whenever possible), being on time and staying for the entire Mass. Parents, thank you for: preparing your children so that they do not need to leave Mass (except in emergencies and never alone); showing children how to genuflect reverently when they enter the church before they sit, and to genuflect to the Blessed Sacrament, if we are able, before leaving the church. Thank you for helping the children with their Bibles or Missals during Mass and for helping them to pray, sing and respond. Thanks be to God that you give such good example and that you help them to honor the Lord from infancy by making your visit in church a time of communion with God. Thank you for your daily Mass attendance and visits to the Blessed Sacrament. Thanks be to God for our monthly Eucharistic Adoration in our parish as well! May God the Father, Son and Holy Spirit bless you, and may the Blessed Virgin Mary, the Mother of Jesus and thus the Mother of the Eucharist, keep you in her care.